Send us your images for custom printed decals and custom made stamps of your signature, studio name, or business logo to have made into a stamp. Read below for more information about Custom Decals or Custom Stamps. The pages will be printed in 8.5” x 14” and the printed area will be approximately 8” x 13”. We will fit as many of your decals as possible per sheet. Please specify the decal size you would like (ex. 2 1/2" wide x 1" high). One size per sheet (multiple sizes of the same decal will be done on a per sheet pricing). The order minimum is 1 sheet. If you would like a sample decal, contact us and we can get one shipped out to you for FREE! High resolution images will give the best quality, a low resolution image may appear jagged or blurry when printed and will yield a poor decal quality. We prefer that the image files are in .PDF, .PSD (Photoshop), or .EPS (Illustrator), but other file formats such as .TIFF and .JPG are also acceptable. If any image manipulation has to be done, please let us know ahead of time. If that is required, there will be an additional $10 set up fee. The maximum file size we can accept is 20MB, if the file size is larger, you can use a free file sending service like Dropbox or Google Drive and send it to clayking.uploads@gmail.com. Our digital decals are printed using a CMYK 4 color process: cyan, magenta, yellow, and black. Black and White images should be in Grayscale. Color images should be in CMYK, as our printer will be printing in that format. To get the best rendering on your computer screen, you can use CMYK SWOP coated profile. Using this will give you the limitations on color with digital printing. No metallics or whites can be printed in the CMYK format. Color matching can be a challenge and we cannot guarantee that certain hues like reds, pinks, and purples will print out exactly as the color in your image. We strongly advise printing a reference of your image to see how the colors may come out once printed. All decals printed will be shipped on Friday. If your order falls near the end of the week, it could be the next week until it is shipped out. Printed Decals cannot be returned as they are printed exclusively for you. When filling out our upload form, let us know that you are looking to have a custom decal made, as the upload form is for both custom decals and custom stamps. Please fill out the form in its entirety. This firing schedule is for firing our decals in an electric kiln. If you are using pyrometric cones, the decals should be fired to cone 012. Our decals are lead-free and safe to use for items that come in contact with food and beverages. Our custom made stamps come in three sizes: 1”, 1.5”, and 2”. 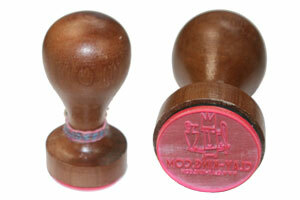 All stamps are on a wooden handle to make your application easier. You can have the stamp made with your image by itself or centered with a circular border. 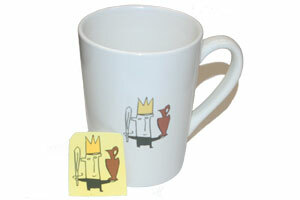 The stamp can also be made to a hard (crisp impression in clay) or soft (to transfer glaze and underglaze patterns). Once you place your order, return to this page to submit your design and let us know if you'd like a hard or soft stamp with or without a circular border in the "Requirements" section of the submittal page. Don't forget to include your order number on the submission! Please allow 2-3 weeks for processing. The pricing for Custom Stamps depends on the size you choose. All custom stamps pricing includes shipping. All images submitted need to be line art such as logos, text, and images that are digital files or can be scanned. Images sent from photographs such as full color images taken with a camera, have shading or gradients will not be accepted. The image you send needs to be in Black and White line art. An example is our logo shown below that we had made into a custom stamp, as well as an acceptable line art image and one that is not acceptable. High resolution images will give the best quality. We suggest at least 150 DPI or higher for the stamps. A low resolution image will provide a poor quality image when it comes to creating your stamp. The preferred format would be a .JPG, .PNG, .EPS (Illustrator), .PDF, or .PSD (Photoshop) file. The images should be fairly simple in design such as a logo, text, icon, shapes, image, or a mix of all of these. If any image manipulation has to be done (basic image clean up), please let us know ahead of time. If that is required, there will be an additional $10 set up fee. We do not do logo designs. 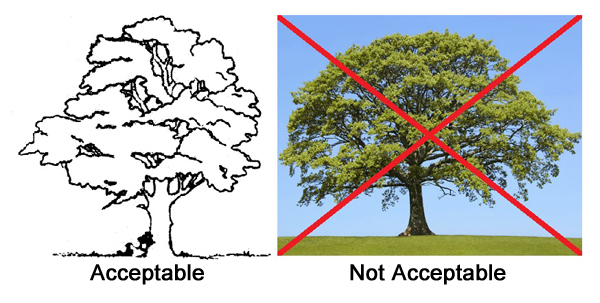 Below is an example of an image that is acceptable for custom stamps and one that is not acceptable. Custom Made Stamps cannot be returned as they are created exclusively for you. Place your order for custom stamps, select the size you'd prefer and quantity. Don't forget to send us the image you'd like for your custom stamp after you have placed your order. Please include your order number (ex. Order # 280000). You will receive your order number after your order is processed. When filling out our upload form, let us know that you are looking to have a custom stamp made and if you want hard or soft, as the upload form is for both custom decals and custom stamps. Please fill out the form in its entirety.